In 1963, Catholic priest James E. Groppi, who grew up in Milwaukee’s Bay View neighborhood, was transferred to St. Boniface Parish, a predominantly working-class black parish located on Milwaukee’s North Side. 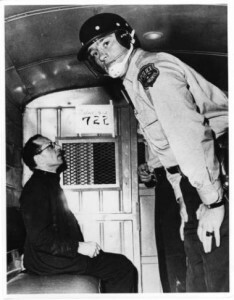 While working at St. Boniface, Groppi became deeply involved in the Civil Rights Movement that was sweeping the nation. In 1965, after returning from the March on Selma, Alabama, he became a member of Lloyd Barbee‘s organization, the Milwaukee United School Integration Committee (MUSIC), eventually rising to the position of second vice-chairman. In 1965, Groppi became the adviser to the Milwaukee NAACP (National Association for the Advancement of Colored People) Youth Council. The Youth Council’s first campaign with Groppi as its adviser targeted the local Order of Eagles Club in 1966. The following year, Groppi and the Youth Council joined forces with Alderwoman Vel Phillips to rally for a strong open housing law in Milwaukee. His final campaign with the Youth Council was the 1968 fight against employment discrimination at the Allen-Bradley Company.